Sous-vide, a French term that means "under pressure," is a method of cooking food that shares some similarities with the culinary processes of poaching eggs and the "low-and-slow" approach to traditional barbecue cooking. 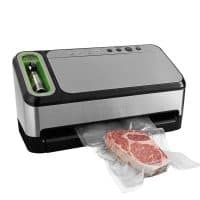 When following sous vide recipes, the chef immerses food, vacuum-sealed within plastic bags, into vessels that are either filled with water or used for steaming food. The food is cooked at lower than normal temperatures for significantly longer periods of time. When done right, by closely following a sous vide time and temperature chart, the food is evenly cooked via pressure, ensuring that there are no spots that are over or under-cooked. While the initial concept of sous-vide can be traced back to material written by Benjamin Thompson in 1799, that approach involved using air as a heating medium. Sous-vide as we know it today was rediscovered in the 1960s and refined in the 1970s, beginning with a superior means for cooking foie gras. 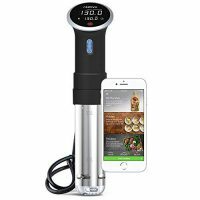 An Immersion Circulator: This device is inserted into your water bath in order to elevate the water's temperature to an exact degree and circulate the water around your vacuum sealed (see our sous vide reviews). A Water Vessel: While you can stick to using a kitchen pot, a Cambro container offers superior benefits due to the increased heat conduction of its plastic construction. A Cast Iron Skillet: If you plan on cooking any sort of meat, a hot skillet is the perfect tool for giving it a finishing sear to lock in all of the moisture contained within the meat. Something to keep the bagged food submerged, such as binder clips or a spoon. Ping pong balls to be placed along the water level of your sous-vide cooker. These will insulate your water vessel, allowing for better retention of heat during long cooking times and also reduce the amount of steam that leaves the vessel. If you plan on cooking multiple dishes at the same time, a divider may be necessary in order to keep everything submerged without making contact. As long as you get the temperature correct, you will never ruin a steak. Just put the temperature at 130°F, and you will guarantee yourself a steak that is the pinnacle of medium-rarity; the same advice goes for never having another dry piece of chicken, just cook it at 140°F. You MUST keep your bags submerged at all times. If even the slightest amount of air bubbles remains within the bag, such as from an imperfect seal or as a result of vaporization from long-term cooking, the bag may lift up to the surface of your water vessel. The delicious flavors that arise from cooking sous-vide comes with an increased cooking time; one hour is usually the barest required minimum. If you like a thick sear on your steaks, you may want to reconsider sous-vide; the great deal of preserved juices within meat prepared a la sous-vide prevents the sear from thickening as deeply as a traditionally prepared version. The sous-vide approach requires more equipment than other techniques. If you are looking to season your meat with spices, oils or garlic, do some research first. While most produce harmless changes, garlic incurs a slight risk of botulism when cooked in an anaerobic environment like sous-vide; fortunately, this risk is safely avoided by cooking at temperatures of at least 130°F. See our Sous Vide Food Safety Guide. Because the juices have had hours to settle and mix, you do not need to let steaks cooked a la sous-vide rest like you would by grilling it. Although sous-vide cooking involves temperatures suitable enough for killing bacteria, those times are still lower than the normal cooking times for food. This means that care should be handled when consuming leftovers or when serving pregnant women.